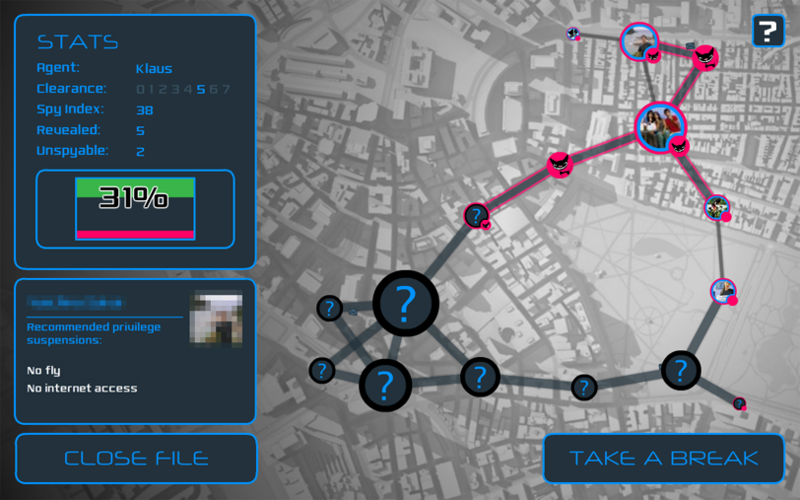 In Hide-and-Spy you tap into citizens’ private communication and compile dossiers about them, aiming to estimate “public threat potential” as suggested by things said by, to and about them. In the role of a governmental agency you need to organize your spying to gather all their information before your subjects “cut you out” by using email encryption. Hide-and-Spy is a parody on governmental surveillance practices and attitudes (as become public knowledge in the post-Snowden era), as much as it is a primer to basic principles of end-to-end encryption. Zentrifuge has teamed up with Kinko.me, the German start-up developing a revolutionary easy-to-use email encryption box (the “Kinko-box“) for contributing a game to the product’s crowd-funding campaign running since August this year. The game is available to play since Sept 4 as browser-(Flash)-game on (and off) Facebook. 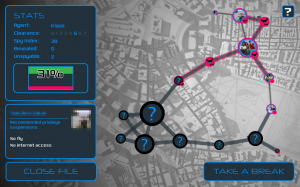 A Facebook log-in will not be required to play, however if used the game will feature the user’s FB friends as surveillance subjects in the game’s puzzles.